The present conditions govern the sale by the Foundation Claude Monet of products sold exclusively on its website. The prices of our products are in Euros net. The Foundation Claude Monet is not subject to VAT. In case of orders towards a country other than mainland France, you are the importer of the item(s) concerned. Customs duties or other local taxes or import duties or state taxes may be payable. These rights and amount are not within the purview of the Foundation Claude Monet. They will be at your charge and your entire responsibility both in terms of declaration and payments to the authorities and organisms in your country. All orders whatever their origin are payable in Euros. The Foundation Claude Monet reserves the right to change prices at any time, but the products will be charged on the basis of the tariff in use at the time of confirmation of the order and subject to availability. The items remain the property of the Foundation Claude Monet until full payment is received. When you take physical possession of the ordered items, the risk of loss or damage of items is transferred. The contractual information is presented in French and will be confirmed at the latest upon validation of your order. The Foundation Claude Monet reserves the right to not register a payment, and to not confirm an order for some reason, and more particularly in case of supplies problems or in case of difficulties concerning the order received. All orders on the Internet site (https://fondation-monet.com) imply full the acceptance of the terms. All confirmation of orders imply full and complete acceptance of terms sales, without exception or reserve. The complete information provided and the confirmation registered will be proof of the transaction: you declare perfect knowledge of these terms. The confirmation of the order has value of the signature and acceptation of the transaction made. Recapitulation of the information of your order will be sent to you in PDF format via the email address of confirmation of your order. Validation of your order means for you the obligation to pay the quoted price. The payment of your purchases is by credit card through the secure Paybox system, hosted by Crédit Agricole. The payment is only in Euros. The customer guarantees the seller that he has the required permissions to use his chosen payment method. In case of refusal by the payment center of the card used, the order is automatically canceled. Under the Article L. 121-21 of the Consumer Code, the customer has a withdrawal period of 14 days to exercise his statutory right of withdrawal and return, at his expense of the product(s) of the order which do not suit him, for any reason whatsoever. Products must be returned in their original and complete condition (packaging, accessories, instructions). In his context, you are liable. Damage to the product at that time may be such as to defeat the right of withdrawal. Notify us of your withdrawal request within 14 calendar days from the date on which you or a designated third party (other than the transporter) received the order. Products to which the right of withdrawal does not apply. Under the article L. 120-20-2 of the Consumer Code the right of withdrawal cannot be exercised for audio or video recordings unsealed by the Customer. Under the article L. 121-21-8 of the Consumer Code, the right of withdrawal does not apply to the provision of services fully executed before the end of the withdrawal period and the execution of which started after prior express consent of the consumer and expressly waiving his right of withdrawal. Our products are available as long as they are visible on the website and in stock. In case of unavailability of a product after placing your order we will notify you by email. Your order and the payment will be automatically cancelled. The items are delivered to the shipping address provided during the order process. In case of delayed shipment, an email will be sent to inform you of a possible impact on the delivery date given you. As required by law, in case of late delivery, you have the opportunity to cancel the order under the terms and conditions defined in the article L. 138-2 of the Consumer Code. If meanwhile you receive the product we will issue a refund and the cost of transport under article L. 138-3 of the Consumer Code. In case of delivery by a carrier, the Foundation Claude Monet cannot be held responsible for late delivery due exclusively to the unavailability of the customer after several appointment offers. The Foundation Claude Monet disclaims any responsibility in case of strike by distribution services. All our products have the legal guarantee of compliance and against hidden defects, under articles 1641 etc of the Civil Code. No product will be exchanged or refunded without the consent of the Seller and before being shipped back (preferably in its packaging) by the Customer to Service retour as soon as possible. The products offered comply with current French legislation. The responsibility of the Foundation Claude Monet cannot be engaged in case of non compliance with the legislation of the country in which the product is delivered. It is your responsibility to check with local authorities concerning the possibilities of import or use of products or services which you plan to order. Moreover, the Foundation Claude Monet cannot be held liable for damages resulting from misuse of the product purchased. Finally, the Foundation Claude Monet responsibility cannot be engaged for any inconvenience or damage arising from the use of the Internet, including a break in service, external intrusion or presence of computer viruses. The current terms of sale are subject to French law. In case of litigation, only the French courts will be competent. 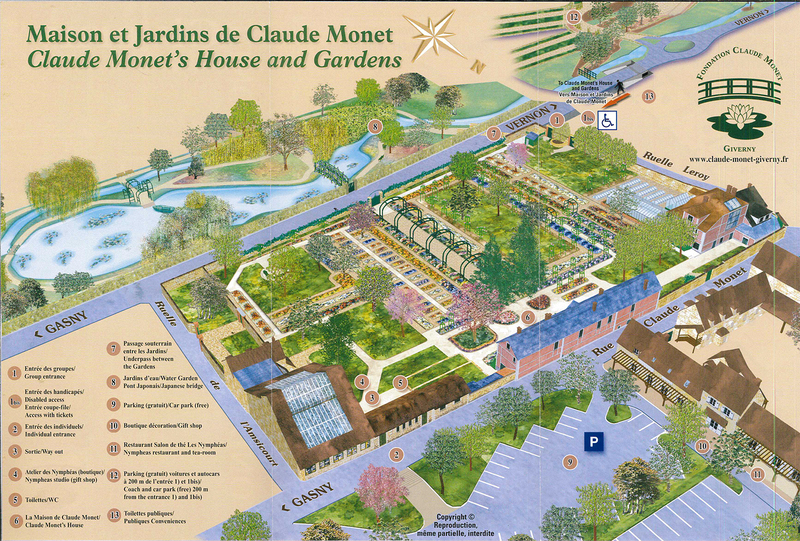 All the elements of the website https://fondation-monet.com are and remain the intellectual and exclusive property of the Foundation Claude Monet. No authorization is given for reproduction, exploitation, redistribution or any other use, even partial, of elements of the website whether visual or sound software. Any single link or hyperlink is strictly forbidden without the written agreement of the Foundation Claude Monet. The Foundation Claude Monet reserves the right to collect personal information and data. They are necessary to manage your order and to improve services and information we send you. Under the law of 6th January 1978, you have right of access, of rectification and opposition to personal information and data concerning you, directly on the website. The Foundation Claude Monet archives purchase orders and invoices on a reliable and durable support as a true copy in accordance with article 1348 of the Civil Code. The records of the Foundation Claude Monet will be considered by all parties as proof of communication, orders, payments and transactions between the parties.